Our mission at JustNeem is to use business and the properties of Neem as an agent for good. This mission is three fold. Our first priority is to develop and sell amazing, high quality products that benefit and comfort the skin of our customers. We take great pride in the quality and effectiveness of every product while using the highest grade raw, wholesome and natural ingredients. Our second goal is all about people. With the use of our Neem skin care products we offer most effective results for healthy skin at an affordable price. We also lift up marginalized people living in the Sahara Desert region of Mauritania, Africa. Through our Neem Tree orchard, we provide living wages to our farmers to support themselves, their families and contribute to their community. Lastly, we look to have a positive effect on our planet by planting hundreds of Neem trees in the desert. Neem trees thrive in hot, dry climates where most trees don’t survive. They help stabilize the soil and increase its fertility, increase the soil’s water holding capability and improve its structure. Neem trees reduce carbon dioxide in the air helping to reduce the effects global warming. We love win-win situations. And we love win-win-win-win situations even more. Call it the quadruple bottom line or being a social entrepreneur, we believe that together we can make a difference in the world through business. These ripple effects spread to all those around us. 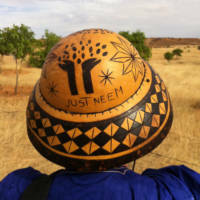 Peter and Magda Radtke started JustNeem after learning about the powerful potential of the Neem Tree. This tree could offer natural skin care solutions, and it could impact the economy of impoverished countries. By planting trees that thrive in harsh, dry climates many of these devastating effects of desertification could be mitigated and even reversed!